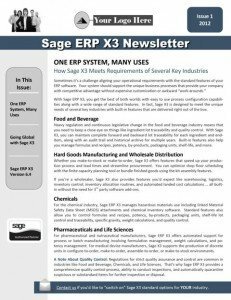 We’re excited to announce the inaugural issue of the Sage ERP X3 quarterly newsletter. It’s the newest member of our Sage Partner Marketing Newsletter Program which now features 6 titles including Sage X3, Sage 100 ERP, Sage 300 ERP, Sage 500 ERP, Sage 100 Fund Accounting, and Sage HRMS. When compared with our other Sage product newsletters which are almost exclusively focused on add-on products and support updates for existing customers, the content of first few Sage ERP X3 issues will be balanced between existing AND prospective customers. Since Sage X3 is relatively new to the North American market, we wanted to create marketing communication that partners could use with both audiences. Sage partners that subscribe to the program receive the articles in a Word document to post on their blog, an HTML file to send the newsletter out via email, and a PDF version which make the newsletters easy to share, download or print. Click below and take a peek at a sample issue of the new Sage ERP X3 quarterly newsletter and be sure to contact us if you’d like a copy of this newsletter to send to YOUR Sage X3 customers and prospects.